On my walking meditations, I always look forward to passing a rose garden in my neighbourhood. One particular day when I was feeling a little low in spirits, I took myself out for a soul stroll in the hope that it would make me feel better. And it worked a treat. I took my usual route through the trees and along the brook, but decided to take a different way back home using a cut-through. As I came out onto the street, I walked straight into the heavenly sweet scent of roses coming from a delightful garden full of rose bushes. With roses of yellows, oranges, reds and pinks abound, the garden was a joyful treat. It was absolutely glorious. It literally stopped me in my tracks and reminded me of the expression: “Stop and smell the roses”. The perfect reminder to slow down and take the time to appreciate the beauty of life. And I think of this every time I pass this blissful garden, and it always lifts my spirits. So with this in mind, my happy for today is being kind by thanking a neighbour for their rose garden. I took myself off for an Artist’s Date brunch today and to sprinkle some more kindness magic around my city. Hidden in-between the condiments at my brunch café. Stuck on the bathroom mirror of the café. 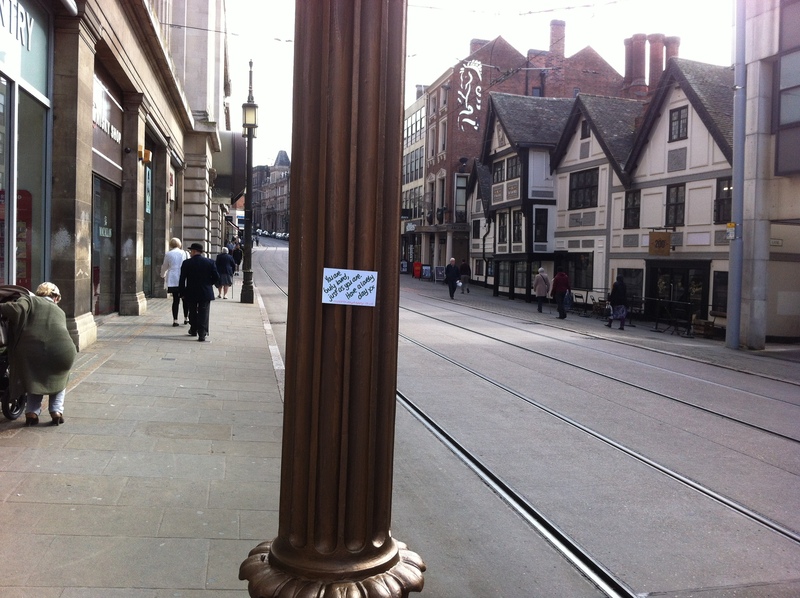 Stuck on a lamp-post in the busy city centre. 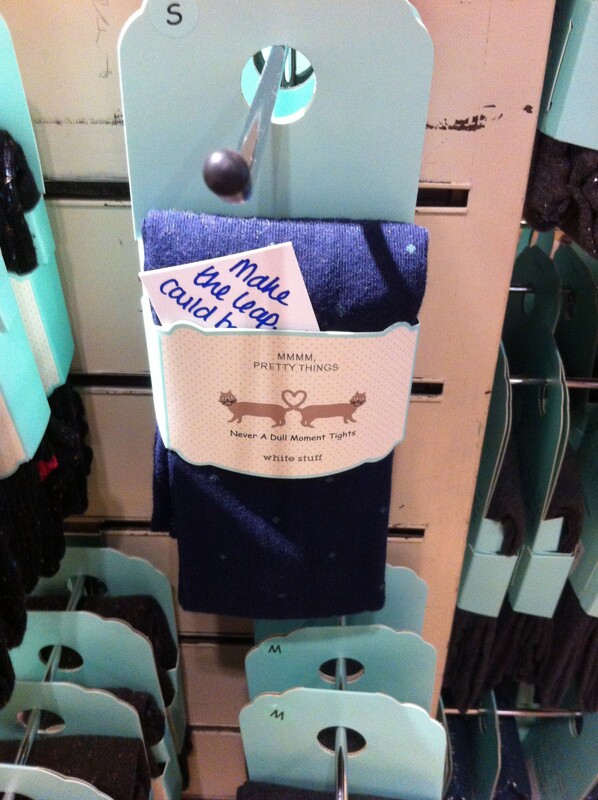 Hidden inside a pair of tights in my fave shop. 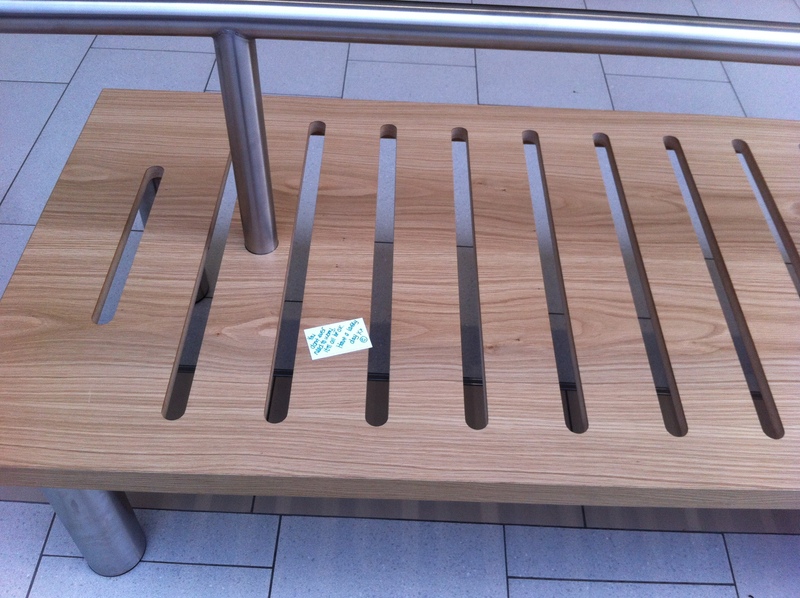 Left on a bench in the main shopping centre. 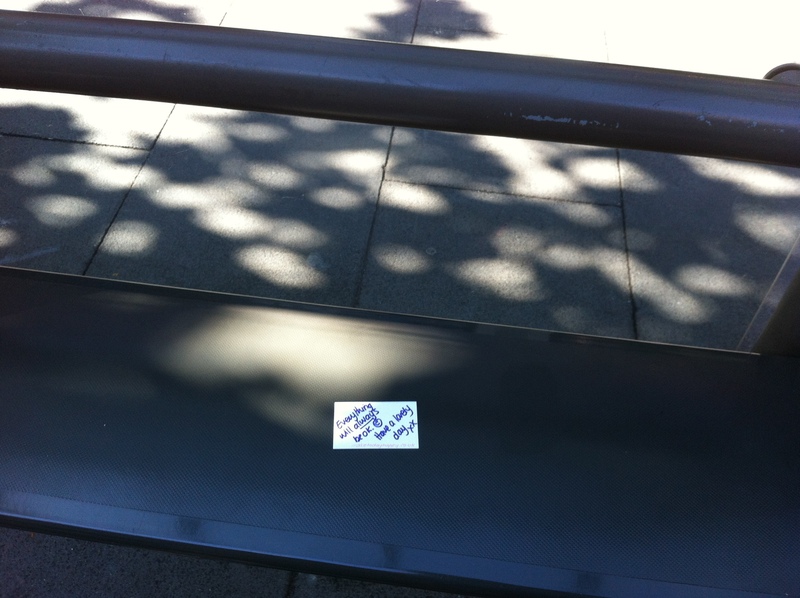 Left on a bench at the bus stop. Again, I wrote this blog address on the card, just in case the finder wants to have a peek. Wouldn’t it be wonderful if they did, and even wrote a comment below, oh my! I was caught red-handed by a lady as I was leaving the last message at the bus stop. She gave me such a big, warm smile; it felt amazing to know that I’ve made one person smile today. And I smiled all the way home. So with this in mind, my happy for today is being kind by leaving kindness messages around my city. This morning I took a soul stroll in the rain into my local town centre. As I was cutting through the town’s biggest car park, I decided to put some money in the ticket machines to pay for someone’s parking. I did this for all three of the ticket machines in the car park, in the hope of making three locals smile on this dreary wet Monday morning. But if not, that’s absolutely fine too – my intention is to spread kindness in my community without expecting anything in return. So with this in mind, my happy for today is being kind by paying for a strangers car parking by leaving money in the ticket machine. 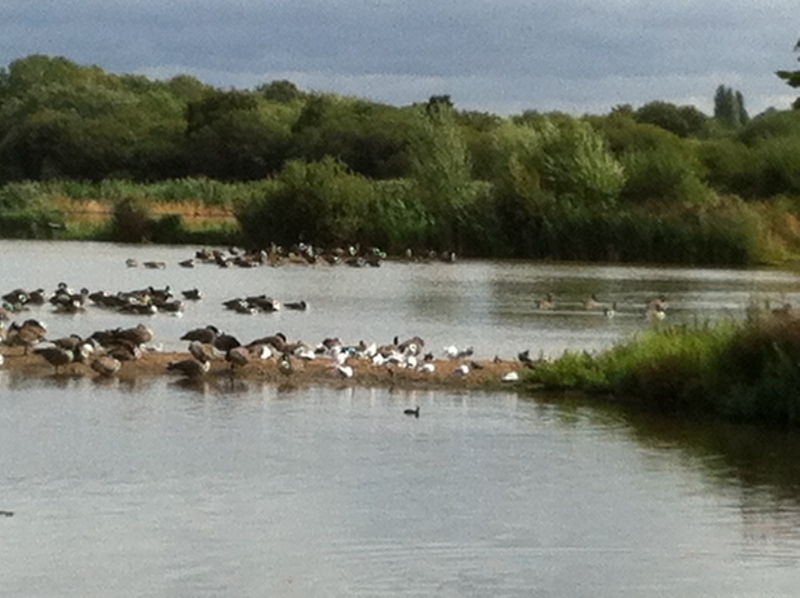 Today I am so happy to have visited one of my favourite localish places for nature: Attenborough Nature Reserve. An award-winning eco-friendly visitor attraction managed by the wildlife trust, it covers 165 hectares and offers 9 miles of trails: it’s a very special place. It feeds and nourishes my soul whenever I visit. I’d love to be a regular visitor, but as it’s a half hour drive and over an hour to walk around the shortest trail, I haven’t felt well enough to go for a long time. But today was the day. Feeling truly grateful and blessed, I strolled along the Tufted Duck Nature Trail soaking up all the gorgeousness that Mother Nature has to offer. It was such a treat to see a gathering of the webbed-feet variety, including an army of frolicking ducks, and swans gliding on the water with their growing cygnets. And it was another treat to witness the magnitude of a few hundred geese flying overhead. As I wandered along the peace-filled open pathways, I breathed in the fresh air and soaked up the peekaboo playing sun from behind the dark, threatening clouds. I marvelled at the sparkling sunshine dancing on the water, and wild heather bowing in the breeze as the wind rustled through the trees. Experiencing a change of scenery, I meandered through the magical forest with the sporadic sunshine dappling through the trees. As I paused on a little jetty at the waters’ edge, a pluto-esque puppy bounded towards me to say hello. Jumping up and almost knocking me into the water, the adorable pup left a giant footprint on my skirt and another one on my heart. Along today’s soul stroll, I couldn’t help but leave a few of my Kindness Cards with messages for people to find: a couple on benches, a couple on the gate posts, and a couple in the cafe. Here’s hoping they brought a smile to other soul strollers. I completed my visit the way I’d started: with a tea inside the Nature House, winner of the Gold award for eco-tourism. As I nosed around the shop, I managed to limit myself to an eco pen, for today anyway! 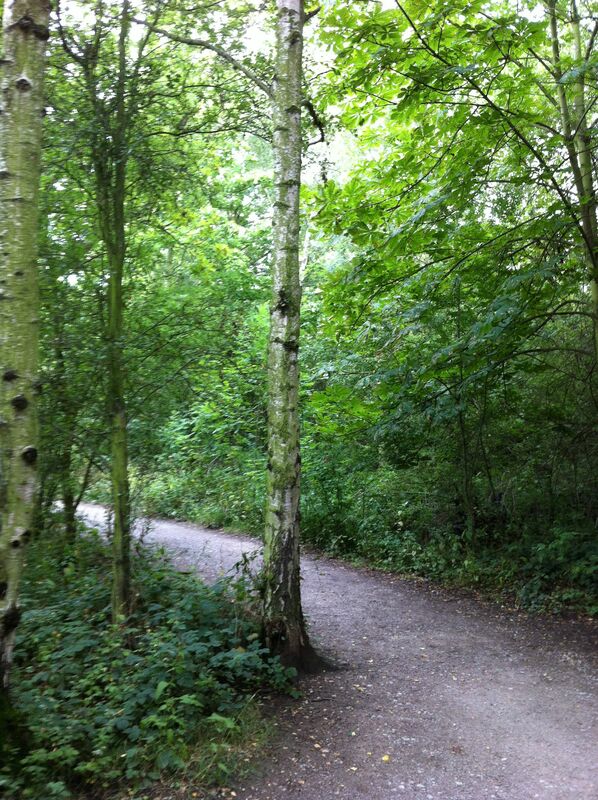 So with this in mind, my happy for today is being mindful during a visit to Attenborough Nature Reserve. Yay! 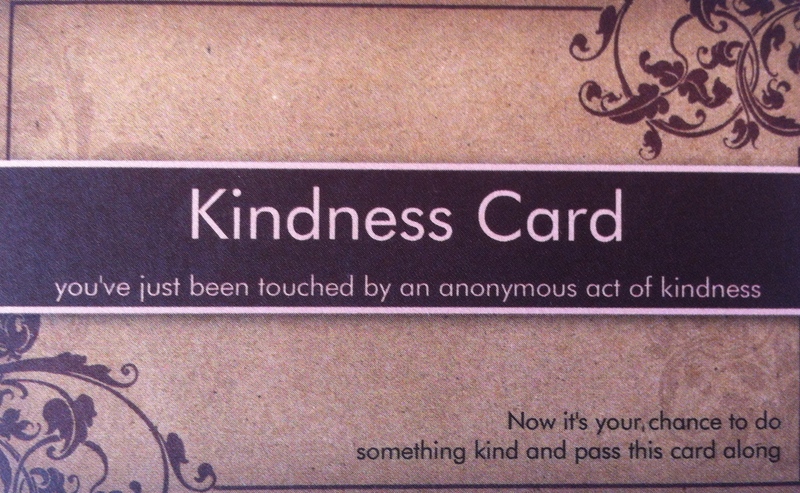 Today I got the chance to use another of my Kindness Cards. Feeling well enough to go out for a couple of hours, I walked into my local town for a coffee. What I didn’t anticipate, however, was the manager’s response: she was genuinely touched and moved to tears by the gesture. The crazy thing is that her response made me feel a little uncomfortable. It made me realise how much easier it is to show kindness to others than it is to accept kindness ourselves. What a learning experience. She accepted my payment for the coffee along with the Kindness Card and promised to pass it along. I didn’t stay long enough to see who was given the free coffee, but that was the idea really. I want to give without expectation of getting anything in return. This is the first time of using my Kindness Cards that involved asking for someone else’s help. Not realising it at the time, it has shown the bountiful benefits of kindness: this one small act has made two, hopefully three, people happy: me, the manager, and, hopefully, the recipient of the free coffee. 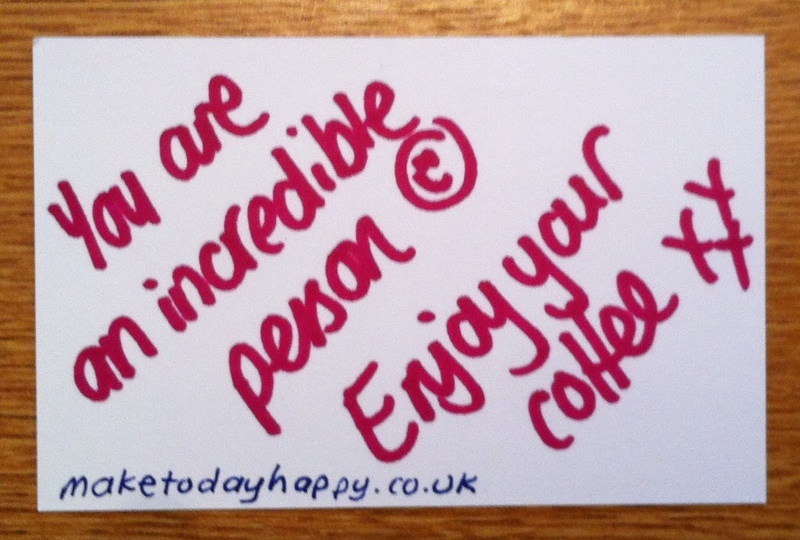 So my happy for today is being kind to a stranger by anonymously paying for their coffee. Time for another Act of Kindness. Inspired by hiding messages in my returned library books last week (see Day 26), I wrote some messages on the back of my Kindness Cards (see Day 3) and decided to hide them around the city for people to discover. 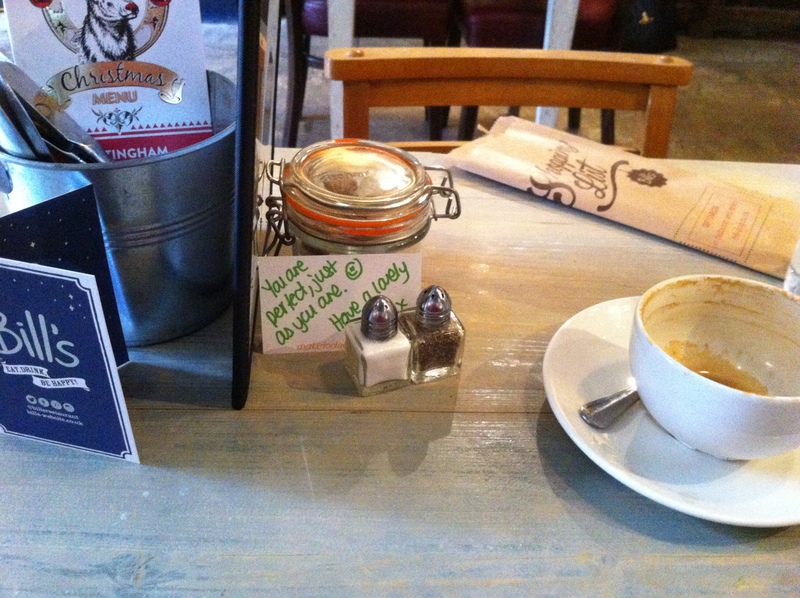 Hid behind the sugar bowl on my table in a café. 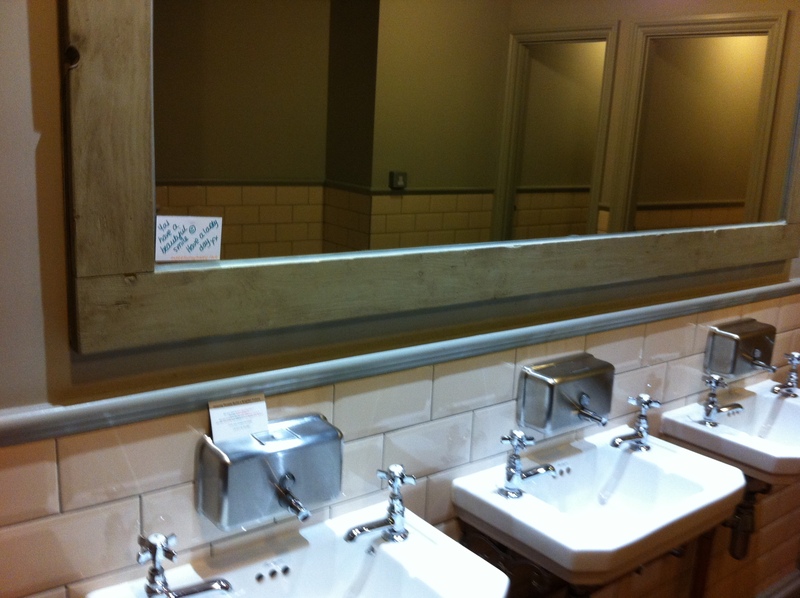 Stuck on the bathroom mirror in a café. Popped inside the front pocket of a beautiful bag in a shop. Left on a bench in the city centre. Placed inside the local paper on an article about Good Deeds! Also placed inside the local paper on an article about Good Deeds! I also wrote this blog address on the card, just in case the finder wants to have a peek. Wouldn’t it be cool if they did, and even wrote a comment, oh my! It’s true what they say about the giver benefits as much as the receiver. I hope I’ve helped to make a couple of people smile today, as much as I have while doing this fun Act of Kindness. So with this in mind, my happy for today is being kind by hiding messages for people to discover. Today’s happy is short and sweet and happy. I wanted to leave messages inside a couple of library books I was returning for the next reader to find. 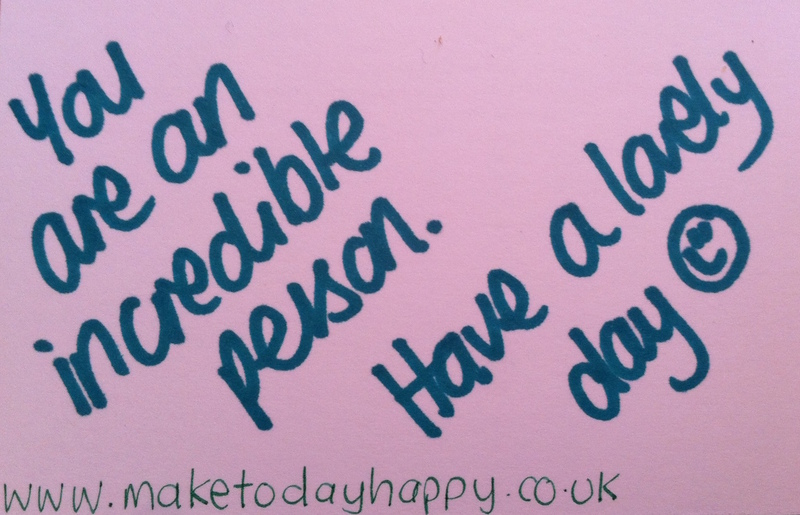 On the back of my Kindness Cards, I wrote: You are in incredible person. Have a lovely day. I decided to write my blog address on the back too, just in case the finder is intrigued to visit. Wouldn’t that be the cherry on the cake. But again, I let go of all attachment to the outcome. My intention is what counts: to make someone smile. 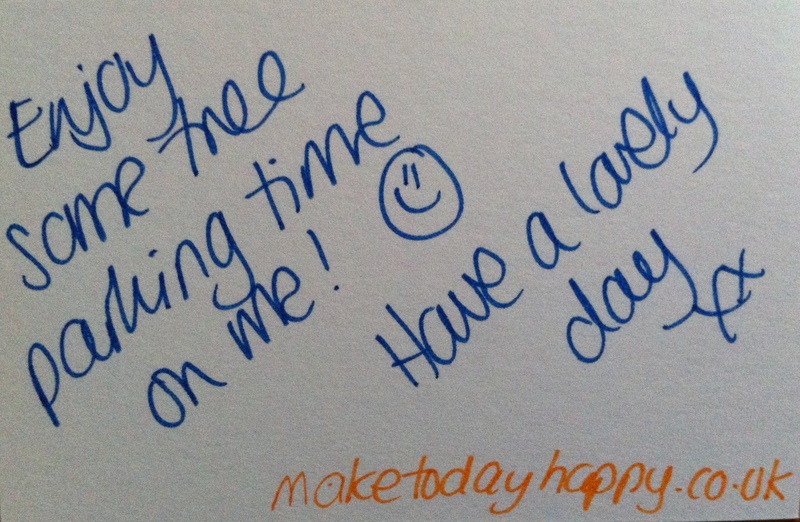 So with this in mind, my happy for today is being kind by hiding a message inside a library book. Today I took a big scary step into the wonderful world of being kind to a stranger: face-to-face. As I’d taken myself into the city for a yummy brunch, I thought this was the perfect opportunity to face this fear. 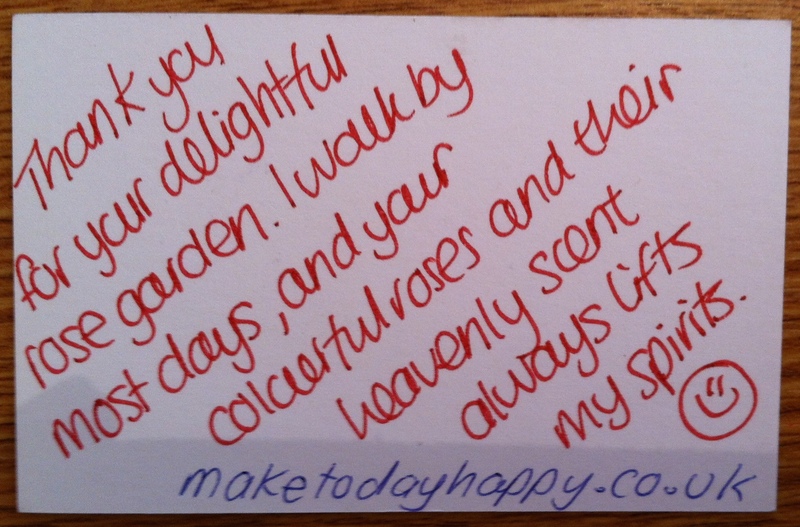 I bought a pretty little bunch of orange gerbera’s and asked the flower seller to attach my kindness card to it, with the words: Enjoy the flowers… you deserve them. Ok, that’s the easy part done. Call me crazy, but I thought an older lady – in her sixties or seventies – would be a good choice for my first attempt. I felt a younger person might be suspicious of my intentions and a man may take my gesture the wrong way: especially as I was so nervous. As I grow more confident, my intention is to do face-to-face acts of kindness to all, regardless of age or gender. With butterflies flitting and fluttering around my tummy, I walked up and down a couple of busy shopping streets. I focused my search to those sitting on benches or waiting at bus stops, as I thought it’d be easier to approach someone who wasn’t rushing off somewhere. I then scanned the seating areas on the city’s Market Square and finally found a couple looking happy and relaxed. The man was doing a crossword, and the lady was watching people go by. She smiled at me as I walked by, and I knew she was the one. My heart pounding, I approached her and told her I’d like to give her the flowers. I explained that I’m doing acts of kindness and asked if she’d accept the gerbera’s from me. She graceful accepted them without question. Phew, I was so grateful. I’d expected a little suspicion as to why I wanted to give a stranger flowers, and was relieved to find an open and willing recipient. The lovely lady explained how they’re just visiting the city, and so sadly didn’t have anywhere to put them. But as she was meeting her sister-in-law later, she would pass them on: spreading the kindness, she told me with a knowing smile. WooHooooo it works! I walked away my heart feeling happy and proud of myself for putting myself out of my comfort zone. So with this in mind, my happy for today is being kind by giving flowers to a stranger. A couple of friends are having a tough time at the moment, and I wanted to do something to make them smile. I thought I’d send them both this gorgeous ‘Hello Sunshine’ postcard. I have the same one on my bedroom mirror, and never fails to cheer me up whenever I look at it. After writing a little message on the back, I posted them with heartfelt love and smiles. Hopefully it will be a nice surprise when the postie delivers them in a couple of days. I think that’s such a shame that sending someone a hand-written letter is practically non-existent these days. As we have become a technology-based society and a increasing number of our social connections are conducted online. I used to LOVE handwriting letters to my childhood penfriends. At one point I was firing off letters to friends in the US, Canada and Germany. Plus an old schoolfriend who moved down south when we were 8 yrs old. I remember the absolute excitement of receiving a letter through the postbox and devouring it many times, word by word. Nowadays, we can have instant connections with friends all over the world through emails, texts and social media, and that still blows my mind. I’m forever grateful to be able to keep in touch so easily with the friends I’ve made on my travels. But nothing beats receiving a hand-written letter or card in the post. So, with that in mind, my happy today is to make a couple of friends smile by sending each a cheerful postcard.